How can one begin to even describe the Bard? William Shakespeare is one of, if not the, most influential person of the literary world to walk the earth. He didn’t just give us plays and sonnets, but defined new genres, tested out stories, and produced characters that have remained in the public eye for four-hundred-years. Yet it is not just literature that he influenced, Shakespeare’s lexicon is incredible, he harnessed the essence of English to produce words and phrases that are vital to the English of today. We couldn’t be ‘tongue-tied’, nor suffer from ‘green-eyed jealousy’, let alone walk down the ‘road’, have a ‘gossip’ or carry some ‘luggage’. Such simple day to day activities would cease to exist; we wouldn’t be able to describe them, to create them; to be a part of them. Looking simply at what the Bard has contributed to the English language in terms of numbers is certainly remarkable. Out of the 17,677 words he wrote, it is estimated 1,700 of these were created by Shakespeare; he changed nouns into verbs, coined verbs into adjectives, then invented new lexis altogether. This list doesn’t even cover the phrases he assembled. Statistically, Shakespeare has given more to the English language than any other writer, he allowed Middle English to be ‘set free’, to evolve, as it continues to each and every day. He created not only the fundamental aspects of the English language, but through his plays these new words were recorded, written down, and able to be viewed four-hundred-years later. No wonder he has such a fan base. It is extraordinary to see how Shakespeare influenced our language and impacted literature from his starting point in Elizabeth England. He altered our language and gave us literature for years to come. We have an awful lot to thank you for Bill; when most of us don’t even realise how significant one man can be. Is this a dagger which I see before me, its handle toward my hand? Macbeth, Macbeth oh worthy Macbeth. I do enjoy a bit of Shakespeare, and seeing the Bard’s work on stage overrides any understanding you can gain from reading alone. I therefore found myself at Manchester’s HOME to see a modern take on this violent and power-hungry play. I’m always intrigued to see how a reworking of Shakespeare can be transported to modern day, this production made it look effortless. That Macbeth’s tale was written to be performed in a sort of dystopian underpass. It was clever, accurate and relatable. It gave the sense of the darkness of the play, both physically in the dungeon-like modern setting, and practically of the murderous rampage the tyrant goes upon. Beginning, of course with the witches; who’s spirits appeared to move them, it was a clever incorporation of dance and choreography. They helped move between scenes, flawlessly being both apart and distanced from the production, it allowed their power to be felt through scenes without physical interaction required. I was, however, slightly disappointed that Hecat was removed from the play, I feel her scene allows the connection of the witches to be portrayed, adding determination to their part. Regardless, the three sisters appeared strong and feminine, mystical and alive carrying the spirits of the play through them. Equally the leads of Macbeth, John Heffernan, and Lady Macbeth, Anna Maxwell Martin, carried through the violence, manipulation and strength required by this play. Lady Macbeth may not have been quite the innocent flower she wished to depict, instead she was surely the serpent underneath, portraying her strength and ultimate madness Matin triumphed in her portrayal. Likewise Heffernan was equally strong and persuasive in the end, overcoming his previous fears to take on his name as tyrant. The two complimented each other, passing over the power, strength of their characters to form an unruly double act. The production was a perfect retelling of this well-known tragedy, elegantly retold in a new setting; the stage clearly the battleground of power and determination. With a cast all holding equal power in their presentation of the story, the tale shone through the stage and transported the audience to the battle of Scotland’s sovereignty. Equally it was engaging to have the play going straight through, the lack of an interval kept the suspense and darkness of the play; allowing it to unfold at a quicker pace. If you’re around Manchester, catch Macbeth at HOME until Saturday 6th February. As I head to London next week to begin an internship it seems fitting to research into my favourite London pastime- the theatre. Whether it be a play or musical, of old or young, I’m eager to see as much as I can in the next eight weeks. Yet how did our affection with the theatre begin? The very first West End theatre opened in 1663, sadly it burned down less then ten years later. However, it’s a clear starting point for London’s famous theatre scene. 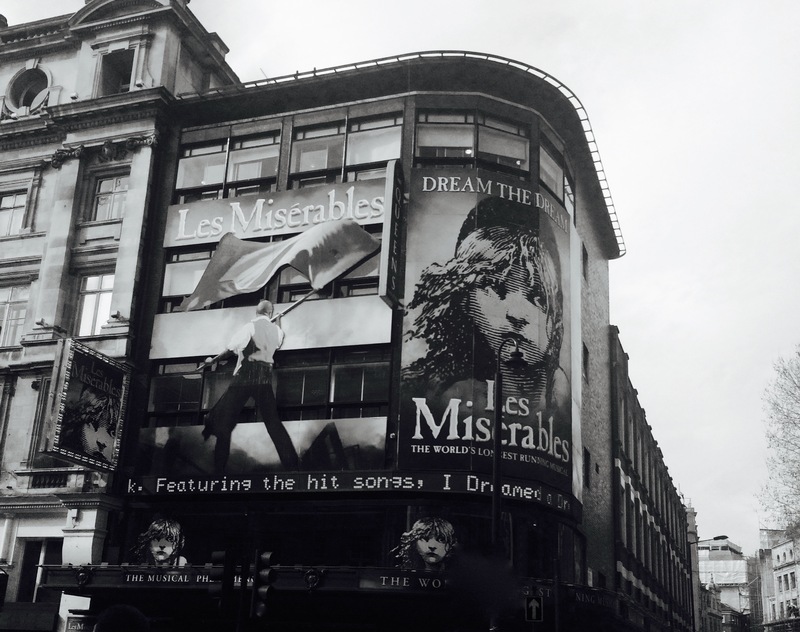 We’ve been venturing around Shaftesbury Avenue for over three hundred years. But we can do slightly better then that, Shakespeare’s play’s nearly 500 years later still appear to be timeless. We each know the love story of Romeo and Juliet, the revenge and jealousy of Othello down to the supernatural Macbeth. It’s an experience to be repeated, enjoyed again and again. So it amazed me to discover that Agatha Christie’s murder mystery stands as the longest continuous play; currently in its 63rd year. That we continue to suspect, detect and manipulate show after show? 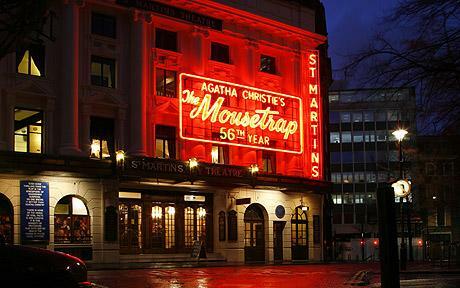 The Mousetrap’s themes are echoed into our every day lives, relatable yet exaggerated. As we in turn take the role of detective for the evening, leaving our own life behind us. Les Miserables stands behind in its 30th year but holds on to the longest running musical. How are we still being transported to France’s revolution eight times a week? Yet each audience fights alongside the revolution, witnesses the love story of Marius and Cosette all in amongst Javert and Jean Valjean’s quest for righteousness and justice; something is clearly working. As new audiences arrive and others return, the theatre scene continues to succeed; we want to be transported to a different world, view a new scene and revisit tales told again and again. What are your favourite theatre shows?